During the Japanese occupation in Singapore, we were living in our rubber estate at Chai Chee, Changi. 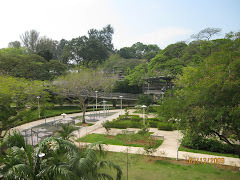 Within the estate was a durian plantation. The trees were all very tall. During the durian season, there were many durians hanging down from the branches. We had a specially built hut not far from the trees. We slept over night and when the fruits dropped we had to search for them. Recently I saw pictures of durians growing at the foot of the trees. Whoever owned them need not wait for the fruits to drop for they were there for the picking. 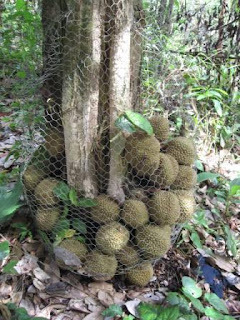 I had been to a number of durian plantations in Singapore, Malaysia and Vietnam, but never come across such trees. 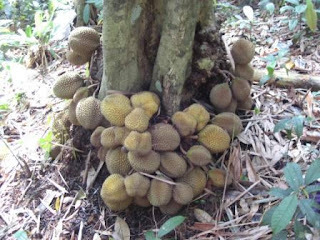 Pictures below show durians growing at the foot of the trees and tree trunks. I was told they were wild durian trees and were found in the Malaysian jungle. 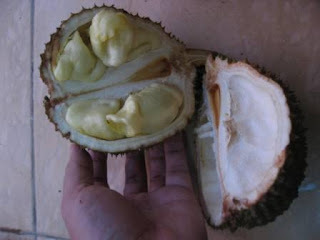 The Malay name for the fruit is Durian Batu. 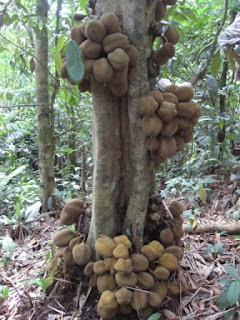 It is also known as durian kura kura (bear fruit at the foot of the tree). Didn't know you have a great blog. Very nostalgic. I like the saputangan postings. I have introduced the handkerchief to my grandson and I told him it serves not only as a towel but it can be used to: wrap his toy-cars, a temporary bandage for a small cut, a bandana for his neck, a cap for his head (with the four corners knotted)and as a blindfold for blind-man's buff. There are many more uses. Just some nostalgia. Wow thanks for sharing the photo...I didn't know durians could grow on those places too.